This document represents the early consensus of the group on the scope and features of the proposed Contacts API. Issues and editors note in the document highlight some of the points on which the group is still working and would particularly like to get feedback. Every operating system and a large number of web-based service providers have different ways of representing address book information. Most users are required to maintain a plurality of contact lists which leads to multiple copies of address book data. The multiplicity of address books that a user is required to maintain often leads to disjointed and inconsistent information being stored across a user's address book providers. Providing address book information to these service providers means handing over all of your data and trusting these providers with the security and privacy of storing and sharing of your information. When sharing this data with 3rd parties users are, more often than not, required to hand over access to their whole address book. Users are implicitly required to trust 3rd parties with all of their data when, in reality, the user may only wish, or need, to share a subset of their address book information so that an application can fulfill its purpose. This specification defines the concept of a user's unified address book - where address book data may be sourced from a plurality of sources - both online and locally. This specification then defines the interfaces on which 3rd party applications can access a user's unified address book; with explicit user permission and filtering. The focus of this data sharing is on making the user aware of the data that they will share and putting them at the centre of the data sharing process; free to select both the extent to which they share their address book information and the ability to restrict which pieces of information related to which contact gets shared. The API itself is agnostic of any underlying address book sources and storage. A conforming implementation is required to implement all fields defined in this specification. Saving a new contact in the underlying addressbook. The API defined in this specification can be used to create, find, save and remove contact information from a user's address book(s). All API methods disclose information related to a user's contacts such as their phone number(s), email address(es) and other personally identifying information. The distribution of this information could potentially compromise the user's privacy. A conforming implementation of this specification must provide a mechanism that protects the user's privacy and this mechanism should ensure that no contact information is creatable, retrivable, updateable or removable without the user's express permission. A user agent must not create, find, save or delete contact information to Web sites without the express permission of the user. A user agent must acquire permission through a user interface, unless they have prearranged trust relationships with users, as described below. The user interface must include the URI of the document origin, as defined in [HTML5]. Those permissions that are acquired through the user interface and that are preserved beyond the current browsing session (i.e. beyond the time when the browsing context, as defined in [HTML5], is navigated to another URL) must be revocable and a user agent must respect revoked permissions. Obtaining the user's express permission to access one API method does not imply the user has granted permission for the same Web site to access other methods provided by this API, or to access the same method with a different set of arguments, as part of the same permission context. If a user has expressed permission for an implementation to, e.g. find a set of existing contacts, the implementation must seek the user's express permission if and when any additional create, find, save or remove function is called on this API. A user agent may have prearranged trust relationships that do not require such user interfaces. For example, while a Web browser will present a user interface when a Web site performs an address book request, a Widget Runtime may have a prearranged, delegated security relationship with the user and, as such, a suitable alternative security and privacy mechanism with which to authorize the creation, retrieval, update and/or removal of contact information. Recipients must only request contact information when necessary. Recipients must only use the contact information for the task for which it was provided to them. Recipients must dispose of contact information once that task is completed, unless expressly permitted to retain it by the user. Recipients must also take measures to protect this information against unauthorized access. If contact information is stored, users should be allowed to update and delete this information. The recipient of contact information must not retransmit the contact information without the user's express permission. Care should be taken when retransmitting and use of encryption is encouraged. Recipients must clearly and conspicuously disclose the fact that they are collecting contact data, the purpose for the collection, how long the data is retained, how the data is secured, how the data is shared if it is shared, how users can access, update and delete the data, and any other choices that users have with respect to the data. This disclosure must include an explanation of any exceptions to the guidelines listed above. Further to the requirements listed in the previous section, implementors of the Contacts API are also advised to consider the following aspects that can negatively affect the privacy of their users: in certain cases, users can inadvertently grant permission to the User Agent to disclose their contacts to Web sites. In other cases, the content hosted at a certain URL changes in such a way that the previously granted contact permissions no longer apply as far as the user is concerned. Or the users might simply change their minds. Predicting or preventing these situations is inherently difficult. Mitigation and in-depth defensive measures are an implementation responsibility and not prescribed by this specification. However, in designing these measures, implementers are advised to enable user awareness of contact sharing, and to provide easy access to interfaces that enable revocation of permissions. The ServiceContacts interface is exposed on the navigator.service object, as defined in [CORE-DEVICE]. The root node from which the contacts functionality can be accessed. The Contacts interface exposes a database collecting contacts information, such that they may be created, found, read, updated, and deleted. Multiple address books, taken from different sources, can be represented within this unified address book interface. Contacts from different sources can be distinguished using the serviceId field.. In addition, multiple address books can be displayed by filtering on the required serviceId value via the Contacts find() function. Equally, multiple contact groups can be represented within this unified address book by specifying consistent tags value(s) as part of individual Contact objects. Multiple contact groups can be displayed by filtering on the required tags value(s) via the Contacts find() function. Create a new Contact object. This method takes one argument. When called, it returns a Contact object. The newly created Contact object must not be stored in the user's address book as a result of calling this method. The Contact save() method must be called on the response of this method to store the new Contact object in the user's address book. attributes ContactProperties ✘ ✘ The attributes to assign to the resulting object. Find contacts in the address book according to the find contacts process detailed below. If a current find(), save() or remove() operation is pending a response, invoke the errorCB with a PENDING_OPERATION_ERROR code. Search for contacts in the address book according to the rules defined in Contact Search Processing. If successful, invoke the associated successCB. If the attempt fails, and the method was invoked with a non-null errorCB argument, this method must invoke the errorCB with a ContactError object as an argument. fields DOMString ✘ ✘ The search qualifier. errorCB ContactErrorCB ✔ ✔ Function to call when the asynchronous operation fails. options ContactFindOptions ✔ ✔ The options to apply to the output of this method. The Contact interface captures a single contact item. This interface extends ContactProperties attributes. All Contact objects must include all attributes supported by the implementation, regardless of whether these attributes have been assigned a non-null value or a null value. If a supported attribute has not been assigned a value by the user and/or implementation, then this attribute must still be present in the resulting Contact object and must have a value of null. A globally unique identifier for the given Contact object. Each Contact referenced from Contacts must include a non-empty id value. An implementation must maintain this globally unique resource identifier when a Contact is added to, or present within, an Address Book. See [[POCO-SCHEMA] Section 7.2.1. id] for additional definition of this attribute. Can we remove this attribute? Does a web application need to know the storage location of a Contact record? This directly relates to ISSUE-43 and discussion thread http://lists.w3.org/Archives/Public/public-device-apis/2010Jun/0248.html. An identifier that may be provided that represents the address book owner of the current contact object. This attribute enables multiple address book sources to be tagged and filtered on Contact objects. A conforming implementation must define a default service identifier on which to store Contact objects that have not yet been assigned to any storage database. The default service identifier will then be used in the Contact save() operation when a serviceId is not recognized or when the serviceId attribute is null. For all other Contacts sources, it is recommended that the serviceId attribute is assigned as a URI. Create a deep clone copy of the current object minus the current object's id attribute. The resulting object must be provided with a newly generated id attribute to distiguish the cloned object from the original object. Remove the current contact from the address book. In the case that the current id attribute is null and this method is invoked, a ContactErrorCB must be triggered as part of the remove contact process. This error must consist of a ContactError object with a code of NOT_FOUND_ERROR. Remove the current object from Contacts. If the removal of the current object from Contacts was successful, set the current object's Contact.id value to null and the current object's Contact.serviceId value to null. Add or update (as appropriate) the current Contact object to the Contacts. If the current Contact.serviceId value is not recognized in Contacts or a Contact.serviceId value has not been set, create and set a new Contact.serviceId value to the default service identifier. If the current Contact.id value is not recognized in Contacts or a Contact.id value has not been set, create and set a new Contact.id value and add the current object as a new object to Contacts. If the Contact.id already exists in Contacts then update the existing object in Contacts. The use of Portable Contacts schema as the format for contacts is subject to further discussions in the group. The ContactProperties interface captures the settable properties of a contact. All properties included in this interface have a corresponding definition in [POCO-SCHEMA]. In addition to the properties defined in this interface, a conforming implementation must support both the Singular and Plural OpenSocial fields defined in [POCO-SCHEMA]. The inclusion of OpenSocial fields in the paragraph above needs further explanation, particularly in relation to contact database searching and sorting. See [[POCO-SCHEMA] Section 7.2.2. accounts]. See [[POCO-SCHEMA] Section 7.2.2. addresses]. See [[POCO-SCHEMA] Section 7.2.1. anniversary]. See [[POCO-SCHEMA] Section 7.2.1. birthday]. See [[POCO-SCHEMA] Section 7.2.1. connected]. See [[POCO-SCHEMA] Section 7.2.1. displayName]. See [[POCO-SCHEMA] Section 7.2.2. emails]. See [[POCO-SCHEMA] Section 7.2.1. gender]. See [[POCO-SCHEMA] Section 7.2.2. ims]. See [[POCO-SCHEMA] Section 7.2.1. name]. See [[POCO-SCHEMA] Section 7.2.1. nickname]. See [[POCO-SCHEMA] Section 7.2.1. note]. See [[POCO-SCHEMA] Section 7.2.2. organizations]. See [[POCO-SCHEMA] Section 7.2.2. phoneNumbers]. See [[POCO-SCHEMA] Section 7.2.2. photos]. See [[POCO-SCHEMA] Section 7.2.1. preferredUsername]. See [[POCO-SCHEMA] Section 7.2.1. published]. See [[POCO-SCHEMA] Section 7.2.2. relationships]. See [[POCO-SCHEMA] Section 7.2.2. tags]. See [[POCO-SCHEMA] Section 7.2.1. updated]. See [[POCO-SCHEMA] Section 7.2.2. urls]. See [[POCO-SCHEMA] Section 7.2.1. utcOffset]. The ContactName interface describes a contact's name. See [[POCO-SCHEMA]] Section 7.3. familyName]. See [[POCO-SCHEMA]] Section 7.3. formatted]. See [[POCO-SCHEMA]] Section 7.3. givenName]. See [[POCO-SCHEMA]] Section 7.3. honorificPrefix]. See [[POCO-SCHEMA]] Section 7.3. honorificSuffix]. See [[POCO-SCHEMA]] Section 7.3. middleName]. The ContactField interface is a reusable component that is used to support contact fields within the ContactProperties interface. See [[POCO-SCHEMA]] Section 7.2.2. primary]. See [[POCO-SCHEMA]] Section 7.2.2. type]. See [[POCO-SCHEMA]] Section 7.2.2. value]. The ContactAddress interface is a reusable component that is used to support contact addresses within the ContactProperties interface. See [[POCO-SCHEMA]] Section 7.4. country]. See [[POCO-SCHEMA]] Section 7.4. formatted]. See [[POCO-SCHEMA]] Section 7.4. locality]. See [[POCO-SCHEMA]] Section 7.4. postalCode]. See [[POCO-SCHEMA]] Section 7.4. region]. See [[POCO-SCHEMA]] Section 7.4. streetAddress]. The ContactOrganization interface is a reusable component that is used to support contact organizations within the ContactProperties interface. See [[POCO-SCHEMA]] Section 7.5. department]. See [[POCO-SCHEMA]] Section 7.5. description]. See [[POCO-SCHEMA]] Section 7.5. endDate]. See [[POCO-SCHEMA]] Section 7.5. location]. See [[POCO-SCHEMA]] Section 7.5. name]. See [[POCO-SCHEMA]] Section 7.5. startDate]. See [[POCO-SCHEMA]] Section 7.5. title]. The ContactAccount interface is a reusable component that is used to support contact accounts within the ContactProperties interface. See [[POCO-SCHEMA]] Section 7.6. domain]. See [[POCO-SCHEMA]] Section 7.6. userid]. See [[POCO-SCHEMA]] Section 7.6. username]. The ContactFindOptions interface describes the options that can be applied to contact searching. When a ContactFindOptions parameter is provided to the Contacts find() operation, it should be processed according to the provisions detailed in Options Processing. A DOMString-based search filter with which to search and intially filter the Contacts database. The maximum number of results to return from the contacts search. This parameter only applies in the case that the associated multiple attribute is equal to true. If no value is provided, the search will return all Contact object results. A boolean value to indicate whether multiple Contact objects are returnable as part of the associated Contacts find() operation. Return only contact records that have been updated on or after the given time, specified as an xs:dateTime. This filter is based on the updated field as defined in ContactProperties. contactObj Contact ✘ ✘ The Contact object resulting from the given Contact save() or Contact remove() method. error ContactError ✘ ✘ The Contact API related error object. The ContactError interface encapsulates all errors in the manipulation of Contact objects in the Contacts API. An error code assigned by an implementation when an error has occurred in Contacts API processing. If the user agent is currently waiting for a callback on a current find(), save() or remove() operation, as defined in this specification. The Contacts find() method provides an operation to search for one of more Contact objects within the Contacts database. The search qualifier provides an application with a way to request the specific subset of ContactProperties it wishes to obtain in any resulting successful callback. The search qualifier is deployed to minimize the data that needs to be shared with an application in order to let that application fulfill its function on behalf of the user. The search qualifier is included within a Contacts find() operation as the filter parameter. A search qualifier must be specified from a requesting application as a part of any Contacts find() operation. If the search qualifier provided is of zero-length then the current Contacts find() operation must not return any ContactProperties within any resulting Contact object(s). In the case that the search qualifier provided is of non-zero-length then the current Contacts find() operation must return only the matching ContactProperties within any resulting Contact object(s). If a specific search qualifier element provided, or filter[x], does not match any well-known ContactProperties attribute, filter[x] should be ignored when executing the current Contacts find() operation. Certain ContactProperties attributes can be considered complex by the fact that the information they contain is available only through child DOMString-based attributes of a complex Object object. In such cases, a requesting application must be able to request both the full complex ContactProperties attribute and also be able to request individual parts of a complex ContactProperties attribute in the search qualifier provided to a Contacts find() operation. For example, the name attribute of ContactProperties is defined to be of complex type ContactName. Therefore, a requesting application may request either the full complex attribute (i.e. name) or specific individual attributes of this complex attribute (i.e. name.formatted, name.familyName, name.givenName, name.middleName, name.honorificPrefix, name.honorificSuffix) as part of a Contacts find() operation's search qualifier. In the case that a complex ContactProperties attribute is defined as a sequence or array of complex objects, specific individual attributes can be referenced by using the complex attribute name, a dot (.) character and the individual attribute to be retrieved. For example, the addresses attribute of ContactProperties allows multiple ContactAddress objects to be defined. To request individual attributes of this complex attribute an application would request e.g. addresses.locality, addresses.region, etc. Return only the valid ContactProperties requested in the provided search qualifier (name, emails.value - friends is not a valid ContactProperties attribute so ignore this element). By default, the Contacts find() operation must return either an empty sequence or a single Contact object, accessible as part of the sequence returned in the ContactFindSuccessCB callback function. If a ContactFindOptions object is provided to the Contacts find() operation and its multiple attribute is set to true, the Contacts find() operation must return either an empty sequence, a single Contact object or [X] number of Contact objects, accessible as part of the sequence returned in the ContactFindSuccessCB callback function. An implementation must specify a suitable integer-based upper cardinality limit to limit the maximum number of Contact objects that may be returned in the case that the multiple flag is true and the limit flag is out of bounds. If a ContactFindOptions object is provided to the Contacts find() operation and its limit attribute is greater than zero and less than or equal to the implementation's upper cardinality limit, then [X] must be set to the provided limit value. The limit attribute is out of bounds if a ContactFindOptions object is provided to the Contacts find() operation and its limit attribute is less than or equal to zero or greater than the implementation's upper cardinality limit. In this case [X] must be set to the implementation's upper cardinality limit. The Contacts find() operation must return successful callback results according to the sorting guidelines defined in this section. A search weight is a numeric value defined for each attribute in a Contact object. A lower value denotes a higher placing in the ultimate sorting of Contacts find() results. Search weights for each ContactProperties field are defined in Appendix B. For example, if a search filter of 'Bob' matches to name.givenName in Object A and to displayName in Object B, Object B will be the first result object returned from the successCB of the given Contacts find() operation, followed by Object A. A search filter may be specified from a requesting web application to initially filter the Contacts database to a more specific set of Contact objects in which it is interested. The search filter is included as the filter attribute of the ContactFindOptions object provided to a Contacts find() operation. A search filter is used to search all the fields of a Contacts database and represents the logical union, or ∪, of provided values that are matched therein. All contact searching must apply a loose-matching policy to the search filter provided. If a ContactProperties attribute being searched in a Contact object, stored within the Contacts database, is a partial value match of the input filter value, that Contact object must be returned as part of the resulting ContactFindSuccessCB. A partial value match refers to both syntactic and semantic partial matching of an input filter value with a corresponding value in the address book and denotes that a corresponding match was found in the address book that begins with, contains or ends with the value of the input filter value, or any variation thereof. A partial value match must use the compatibility caseless manner in which to match against corresponding values in the Contacts database. The rules for processing search filters is defined below and is always provided with a filter parameter, representing the filter attribute of the ContactFindOptions parameter provided within the current Contacts find() operation. Let contactsets be initially the set of all known contacts in the Contacts database. Let contactsresult be initially an empty Object object. Let contactset be the next enumerable Object in contactsets. If there is no next enumerable Object, go to step 5. Let partialMatchFound be the result of applying the partial matching algorithm, providing filter and contactset as inputs. If partialMatchFound is true, add contactset to contactsresult. Sort contactsresult according to the guidelines in Search Sorting. Let hasPartialMatch be initially set to false. Let elementvalue be the String value of the next enumerable property in contactset. If there are no more enumerable properties, go to step 5. Let hasPartialMatch be the boolean result for the comparison of filter with elementvalue in a compatibility caseless manner and with a partial value match policy applied to both sides of the comparison operation. If hasPartialMatch is true, go to step 5. Return only the valid ContactProperties requested in the provided search qualifier (name, addresses.locality, addresses.country, phoneNumbers, emails) and only for the Contact objects returned from the rules for processing search filters with the search filter derived in step 1 provided as the filter input parameter. This specification is primarily intended to provide the user with the ability to view and control the contact information that may be shared, saved or removed from their unified address book. This annex provides some examples of a conformant user experience that this specification enables. If an additional find(), save() or remove() operation is called by the current web application before the user has clicked 'Select' or 'Cancel' on the current notification, an error will be invoked with a code of PENDING_OPERATION_ERROR. If the user clicks 'Cancel', the ContactErrorCB defined for the find() operation will be invoked with an error code of PERMISSION_DENIED_ERROR. 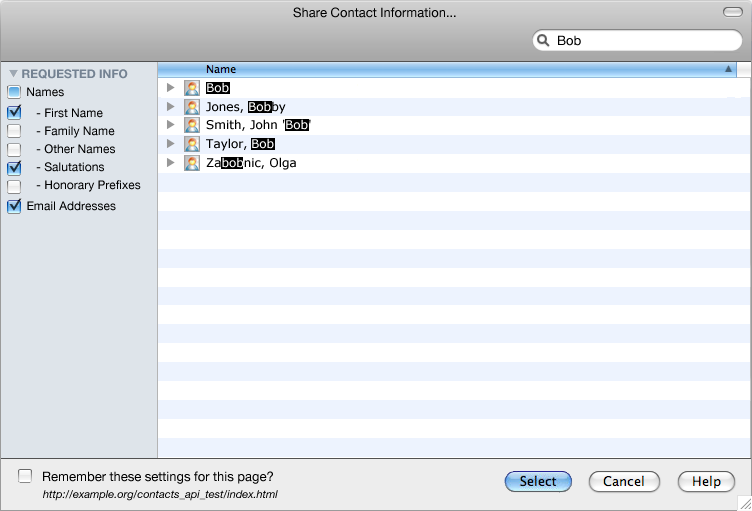 In this dialog, the user is provided with a summary of the sharing that the application is requesting and the option to select one or more contacts (as appropriate) from the user interface. If the user clicks 'Cancel', the ContactErrorCB associated to the current find() operation will be invoked with an error code of PERMISSION_DENIED_ERROR. If the user clicks 'Select', the ContactFindSuccessCB associated to the current find() operation will be invoked with the contact information selected by the user provided as the only parameter. Further to this initial sharing of Contact information, the Security and Privacy Considerations section expects that the user should easily be able to review and revoke permissions to web applications at a later date. Include Contact creation/modification writeback mockup. Include Contact deletion writeback mockup. The following table defines the search weight values for each search qualifier provided in this specification.